They’re All Champs — Above are the 18 prize winners, best in their classes, at the annual aquatic meet held Friday afternoon at the Ward 1swimming pool. The champions are: Front row, left to right. Claire Devine, Georgette Bousquet, Bunny Burke, Patricia Bourquet, Joan Vienneau, Ann Barnett, Ann McAndrews and Christine Blanchette; rear, Constance Burke, Irene Gosselin, Carol Claire, Shirley Savard, Dorothy Krajewski, Agnes Corley, Julia Garbacik, Barbara Krajewski, Judy Dietz, and Lou Ann Zwirblia. The annual aquatic carnival featured girls who received their training from instructors at the pool. The skill they showed in executing difficult maneuvers was a reflection of the diligence and competency shown by Mrs. Berry Dooley and Miss Patricia O’Donnell who taught the classes. Judges were Robert Gaughan, Michael Redding, Theresa Gordon, Jeanne Lecour, Maureen Clark, Patricia Delisle and Janet Mungall. Songs by Bunny Burke, Beverly Walsh and Claire Devine opened the exhibition. Fancy diving followed and winners were Julie Garbacik, Anne Burnett and Dorothy Krajewski. Then came the races. Winners of the six-year-olds’ dash were Patsy Bourque and Joyce Goulet. 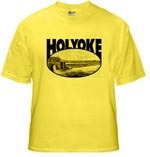 Prizes in the seven to nine age group went to Bunny Burke and Claire Devine; winners of the 10-year-olds’ races were Midge Burke and Kathleen Devine; 11-year-olds, a tie between Carol Clare and Judy Dietz; 14-year olds, Barbara Krajewski and Joanne Zwirbia. During intermission, Joanne Vienneau sang. The events then went of with breast stroke racing. Winners in the midget race were Bunny Burke and Claire Devine; junior race, Julie Garbacik and Judy Walker; senior race, Joanne Zwirbia and Agnes Corley. In the side stroke races, winners of the midget dash were Bunny Burke and Georgette Bousquet; junior dash, Ann Burnett and Ann McAndrew. Winners in the back stroke race were Julie Garbacik and Ann McAndrew. In another intermission Joyce Goulet sang. The five-year olds took part in a skit, “How Do You Do, My Partner,” with Anne Lafond, Kathy and Noreen Phillips, Patsy Albano, Ruth Descelles, Elaine Gero, Barbara Loughran and Becky Walker participating. 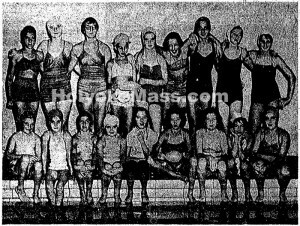 Other swimmers who took part in a skit, “Jimmy Crack Corn,” were Claire Devine, Bunny Burke, Lucille Boissonault, Beverly Walsh, Patsy Burke, Joanne Walker, Joanne Cavanaugh, Joyce Goulet, Anne Burnett and Joanne Vienneau and then did a tango. Sisters raced against each other and the winners were Midge Burke, Claire Devine, Irene Gosselin and Barbara Krajewski. In a comedy skit, Claire Devine, the mother, rode her baby, Beverly Walsh, around in a baby carriage and then dumped her in the pool. Lucille Boissobault entertained with songs. A ballet exhibition was given by Ann Burnett, Bunny Burke, Julie Garbacik, Shirley Savard, Pauline Ciurchesne, Ann McAndrew, JoAnne Vienneau, Dorothy Krajewski, Midge Burke and Carol Clare. In the peanut and spoon race, winners were Joanne Zwirbla and Carol Clare. Winners of the tin hat race were Julie Garbacik and Judy Dietz. In the pie plate race, JoAnne Zwerbla and Ann Burnett won. Prizes in the balloon race went to Midge Burke and Bunny Burke. Umbrella racing winners were Joanne Zwerbla and Anne Burnett. Winners of the potato race were Carol Clare and Julie Garbacik. THe show closed with formation swimming. Those who participated were Pauline Courchesne, Claire Devine, Christine Burnett, Lucille Boissonault, Judy Dietz, Kathleen Devine, Georgette Bousquet, Agnes Corley, Joanne Zwerbla and Franny Shea.